We have had a fantastic fall/winter on our crappie here at BigCrappie.com Guide Service. Our bite has stayed pretty strong thru Christmas with nice cooler fulls of really fat crappie. Now that the water temp is getting near 50 degrees the bite normally slows down a bit. As of now though we are still doing pretty good. I will let you guys know when it changes for us. The good news is if it's a mild winter the good bite could last all winter long. Good numbers of whites are still being caught but the white bass bite has slowed down since the water has cooled down. Good numbers are still common but the overall bite has slowed down resulting in us bringing in less fish. On the windy overcast days we are finding lots of hybrids working bait near the surface under birds. On the clear sunny days it's much tougher to find and catch them. We have been catching several per trip while crappie fishing here lately. There a blast to catch on an ultralight rod/reel. We are going to be at the Dallas winter boat show and also at the tackle show again this year. We will be offering a show special as usual. Please come by and visit our booth and book your next fishing adventure. The crappie bite has been excellent lately. 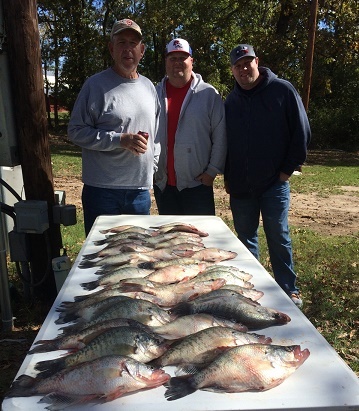 Brush piles in 15ft of water have been producing good numbers of quality crappie. This fall has been awesome white bass fishing. Limits of quality whites have been very common. Our hybrid stripers finally turned on this last week. Hopefully they will continue to do great now that the water has cooled down. Birds have been working the fish and we have been chasing them with great results. 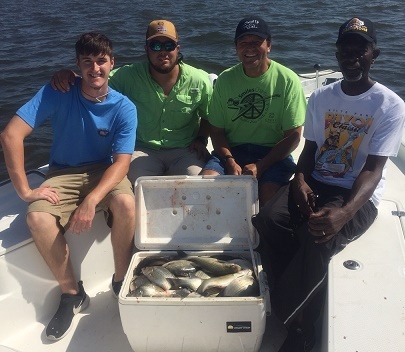 It’s a great time to come out and catch fish. November generally kicks off our winter fishing here on CC. The fishing is excellent right now. Come down and have a blast catching trophy fish with BigCrappie.com this month. Crappie-Good/excellent - Jigs over brush piles in 10-20ft of water. Whitebass - Excellent - Limits of big white bass very common on main lake points in 10-20ft of water on slabs and spoons. 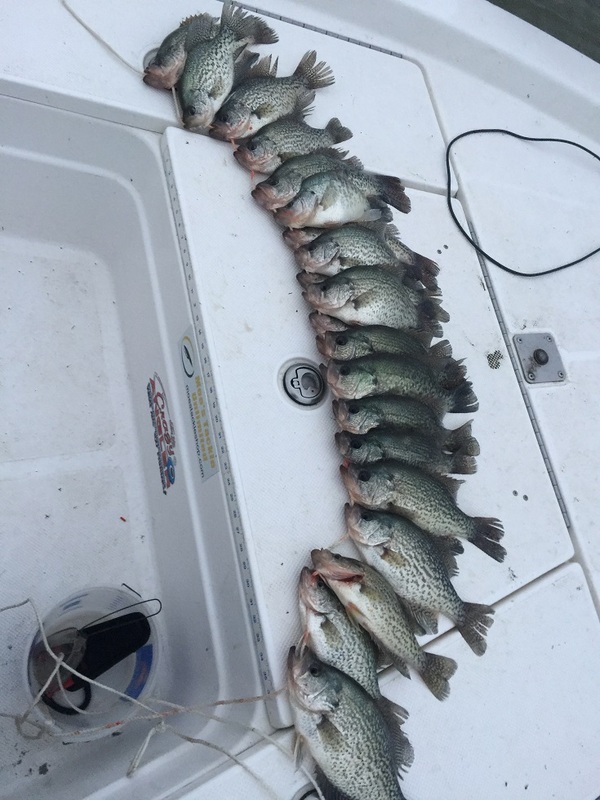 Brush piles 10-20 ft are holding a bunch of nice crappie. We are catching them on jigs with 6 lb line. This latest cold front has pushed more fish into the shallower waters. The next two months should make for some fantastic crappie fishing again. Humps and points in 10-15ft of water has been excellent. Whites this time of year are generally very good. We normally catch plenty of fish to take back. They are normally found on points and humps in 10-15ft of water and can be caught using slabs, and spoons. Some surface action can be found at times but it is not common for them to surface every day this time of year. 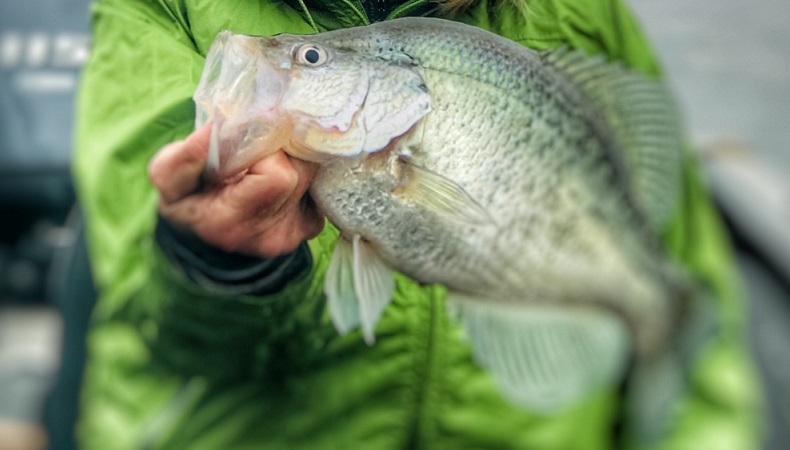 The crappie this time of year are generally slow. We do at times catch them really good this time of year but that is the exception. Jigs and minnows over brush piles are normally the pattern we do best on. 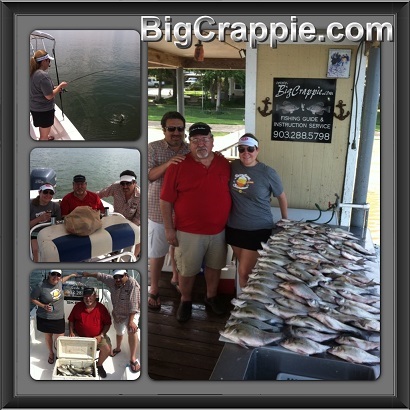 All trips ran from August till Sept are normally a mixed bag of crappie and or white bass. 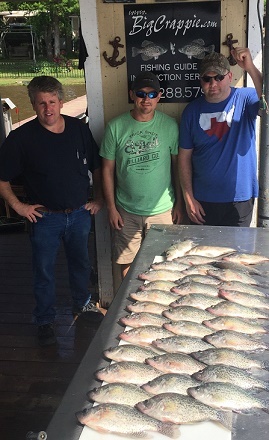 We do this due to the excellent white bass bite and slower crappie bite we experience during this hot time of year. If you only want crappie its usually late September before they really pick up again. Book early for October and November, we normally get very booked that time of year. Lots and lots of catching. These fish gather in huge schools this time of year and we can almost always catch lots of them. Best depths 15-25ft of water. Good numbers will still be caught during the heat of summer but there will certainly be days that they are slow. The hot summer temps just arent as good on the crappie as the fall months. Jigs over brush piles in 15-25ft of water is best. 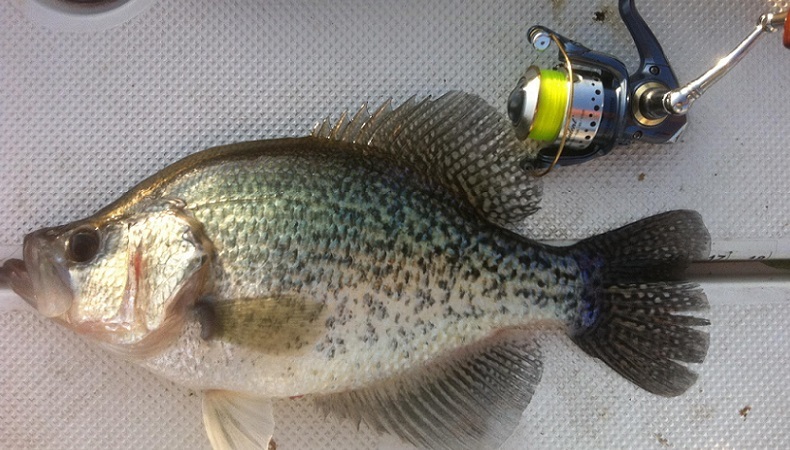 Our crappie have slowed down some but good numbers of crappie can still be caught. Jigs or minnows over brush in 15-25ft of water. The white bass bite is excellent. We are also catching some very nice hybrid stripers. The crappie bite has been excellent for some time now. We are still catching respectable numbers of fish on each trip. brush piles in 15ft of water has been our best depths. White Bass - The whites have been good. We have had a surface bite early in the morning but it doesnt last real long. Then we are having to catch them in 15-20ft of water on windy points and humps. good numbers are still being caught. 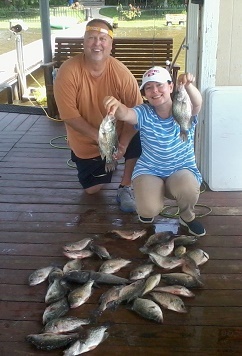 We are still catching lots of crappie! if your waiting till it gets easy now is the time. All our fishing this summer will be straight down below the boat fishing over brush piles. I'll even make it easy and bring minnows if you want. The fishing right now is excellent. we are still catching limits of crappie and having lots of fun doing it. Early morning surface activity can make catching these fish easy at times. Sometimes we will even catch them two at a time. 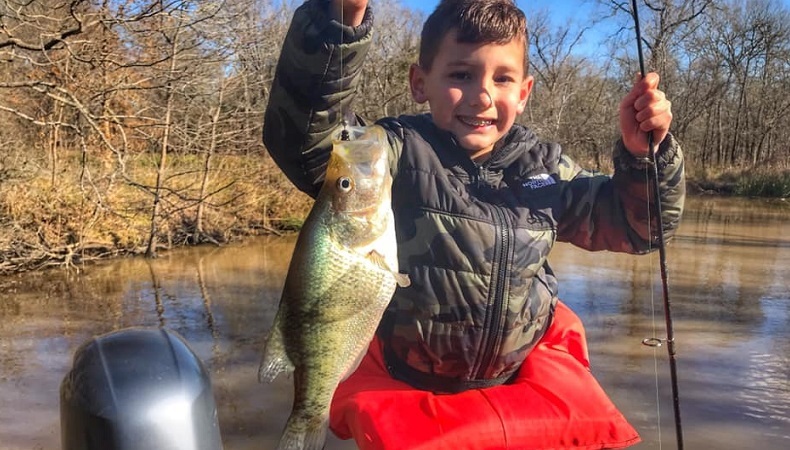 We are still catching lots and lots of crappie! Jigs over brush piles and jigs shot under docks are still producing big numbers. We have an excellent surface bite early in the morning and a very good slab bite after about 9am that lasts all day long. Limits of whites mixed in with big hard fighting hybrids have been the normal routine here lately. Book now for a fun action filled trip of a lifetime! 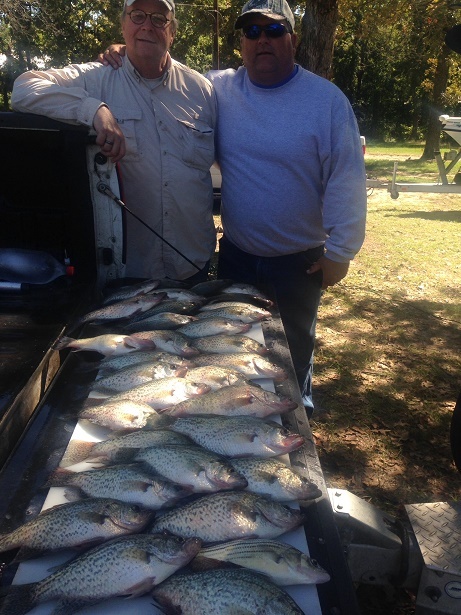 We are catching good numbers of crappie on docks and some on brush piles. Expect the crappie to start moving on the brush piles very soon as they finish up there spawn. The whites have finally began to surface nearly every day making it easy to catch them. They are also stacking up real nicely on points and humps on the main lake like they’re supposed to. Best baits are sassy shads and TNT slabs. It doesnt get much better than it has been lately. If your wanting to catch crappie this time of year is hard to beat. The fish have been on docks but are now beginning to move onto brush good also. Lots of surfacing fish lately, the fishing has been great! The whites have began feeding again on the lake. The last few days they have been working the surface really good. Best depths 6-18ft using anything for bait. the fish are moving in & becoming more active with all the warm weather. I'm expecting by next week to be on a good pattern. Catching a few but there as slow. Expect everything to get better as soon as the water gets above 50 and then it should get really good when it stays above 60. Book now for spring, were getting very booked up through April. The bite on the whites has been good overall. They can be found in water from 20-30ft on the main lake body around humps and points. We are using slabs to catch these fish on the bottom. The bite should be excellent in about a month when the fish begin moving shallow. The crappie has been slow overall. Jigs over brush piles in 25-40ft of water have been the best. Bridges will begin to start holding some fish pretty soon as the fish enter there prespawn pattern. Expect the catch rate to increase in February. Anyone wanting to catch the white bass run it generally starts in late Feb and last through March. It generally offers fast action and beautiful scenery in the small creeks we fish. We often see beavers, deer, pigs, and lots of different types of birds. The crappie will also be moving into the creeks at the same time. Call me if you’re not sure when to book your trip. Generally by March our books are getting pretty full. Please call and reserve your date today.